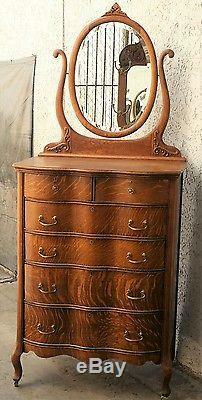 Vintage Tiger Oak American TALL SERPENTINE HIGHBOY DRESSER w/ Mirror RESTORED LA Area. 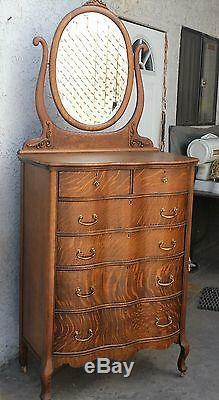 We are proud to offer an extremely nice estate furniture. It is simple, elegant, and classic all rolled into one. It is a perfect estate piece to gift or wonderful to start or add to your collection. 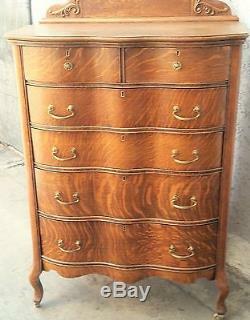 Beautiful quartersawn oak (1/4 or tiger oak) highboy. 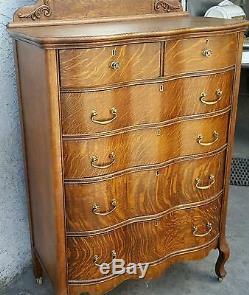 This is a particularly tall dresser. It has a nice deep serpentine front. 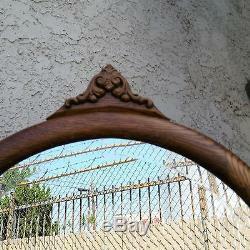 The mirror is hand beveled oval glass. The oak grain pattern is fabulous. A lock in every drawer shows it originally was meant for a home with servants. It is an extremely versatile piece of furniture which is extremely beautiful and very well made. This is an original piece not a later reproduction. 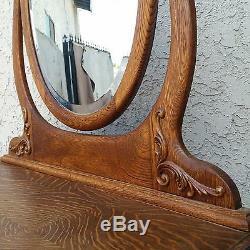 It has been previously restored including regluing and refinishing. Highboy dressers are a substantial amount of restoration work since every drawer and the whole case is re-glued. Then it is refinished inside and out. If there was any other damage, it was professionally repaired. The wear is normal and appropriate to an item of this age. There are reflections in the photographs. Dont miss out on this really wonderful item! Height is about 82 1/2 inch. Width is about 36 1/4 inch. The sooner you pay, the sooner you get your item. Otherwise, we reserve the right to re-list the item for sale. California residents please add 9.5%. It is located in the Los Angeles Area. Specifically in Bellflower near the 91 and 605 freeways. Item must be picked up within 60 days. We try to describe all our items very accurately. We will be happy to reply as quickly as we can. 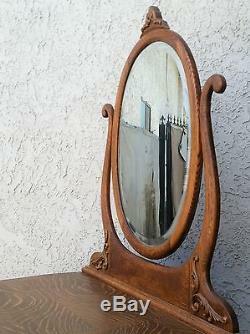 The item "Vtg American Tiger Oak TALL SERPENTINE HIGHBOY DRESSER & Mirror RESTORED LA Area" is in sale since Saturday, January 12, 2019. 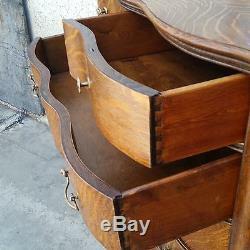 This item is in the category "Antiques\Furniture\Dressers & Vanities\1900-1950".